The General ever desirous to cherish virtuous ambition in his soldiers, as well as to foster and encourage every species of Military merit, directs that whenever any singularly meritorious action is performed, the author of it shall be permitted to wear on his facings over the left breast, the figure of a heart in purple cloth, or silk, edged with narrow lace or binding. Not only instances of unusual gallantry, but also of extraordinary fidelity and essential service in any way shall meet with a due reward. Before this favour can be conferred on any man, the particular fact, or facts, on which it is to be grounded must be set forth to the Commander in chief accompanied with certificates from the Commanding officers of the regiment and brigade to which the Candidate for reward belonged, or other incontestable proofs, and upon granting it, the name and regiment of the person with the action so certified are to be enrolled in the book of merit which will be kept at the orderly office. Men who have merited this last distinction to be suffered to pass all guards and sentinels which officers are permitted to do. The road to glory in a patriot army and a free country is thus open to all. This order is also to have retrospect to the earliest stages of the war, and to be considered as a permanent one. 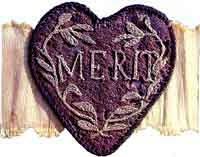 By order of the President of the United States, the Purple Heart established by General George Washington at Newburgh, August 7, 1782, during the War of the Revolution, is hereby revived out of respect to his memory and military achievements. The newly reintroduced Purple Heart was not intended primarily as an award for those wounded in action — the “wound chevron” worn by a soldier on his sleeve already fulfilled that purpose. 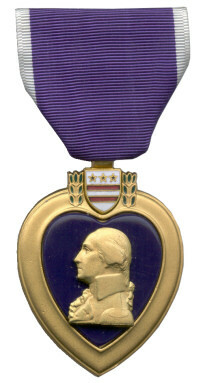 Establishing the Meritorious Service Citation as a qualification for receiving the Purple Heart was very much in keeping with General Washington’s original intent for the award. In November 1952, President Harry S. Truman issued an Executive Order extending eligibility for the award to April 5, 1917, to coincide with the eligibility dates for Army personnel. President John F. Kennedy issued Executive Order 11016 in April 1962 that further extended eligibility to “any civilian national of the United States, who while serving under competent authority in any capacity with an armed force…, has been, or may hereafter be, wounded” and authorized posthumous award of the medal. Executive Order 12464 signed by President Ronald Reagan in February 1984, authorized award of the Purple Heart as a result of terrorist attacks or while serving as part of a peacekeeping force subsequent to March 28, 1973. 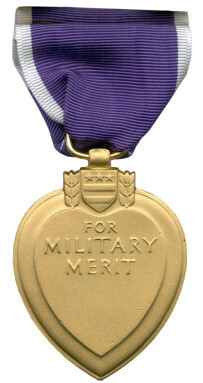 The 1998 National Defense Authorization Act removed civilians from the list of personnel eligible for the medal. Possession of the Purple Heart medal does not by itself qualify veterans for Department of Veterans Affairs (VA) disability compensation. However, since November 1999, Purple Heart recipients have been placed in VA’s enrollment priority group 3, unless eligible for the higher priority groups (1 or 2) based on service-connected disabilities. Recipients are also exempt from co-payments for VA hospital care and medical outpatient care, but not from pharmacy co-payments for medications prescribed for nonservice connected conditions. 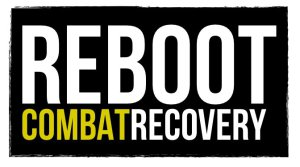 Text from U.S. Department of Veteran Affairs website; Text and photos in the public domain.